Today we are glad to introduce a new feature. Now when you switch to Edit mode and select a word you can change its color directly without changing anything in Words table. Today we are excited to present a new feature - manual positioning of words. 3) Select a word. Position it anyway you like. Change its size or rotatation angle. 4) Visualize your cloud again. Selected words' positions and sizes will be preserved. 5) If you wish to reset the selection (to revert the words to be automatically positioned and sized) click "Clear selection" button. We tried our best to make it easy to use and still functional. Hope you enjoy it! Please give us your feedback in the comments or by contacting support. Today some changes to words repetition mechanism has been implemented. Before all words were repeated by default and every repeated word had random attributes (color, font, angle). , angle, font specified in Words table) from the parent word. Before the changes you couldn't create such a cloud. Let's say you have some word with "Bangers Regular" font specified in fonts table. But you want all repeated words to be in "Briep Medium" font as it is set in Fonts section. Then you need to uncheck "Repeat?" value for that word and add another word with the same text and random attributes. The latter word will be repeated with random attributes that mimics old behaviour. Hope you gonna like the changes. We wish you all a wonderful Christmas, and a happy and creative New Year 2015! Custom fonts – new feature! We have been constantly asked to add various fonts to Tagul. In spite of adding some new fonts recently in many cases we had to drop the requests due to license restrictions. In some cases we considered advised fonts not good enough for whole Tagul audience (while it still can be wanted by some users). And finally we simply couldn't expand the list infinitely making it bigger and bigger each time. Now this problem is over because the feature of adding custom fonts is finally delivered today! It is available for all Tagul users (both free and premium). To add a custom font scroll to the top of Fonts section and click on the corresponding text. 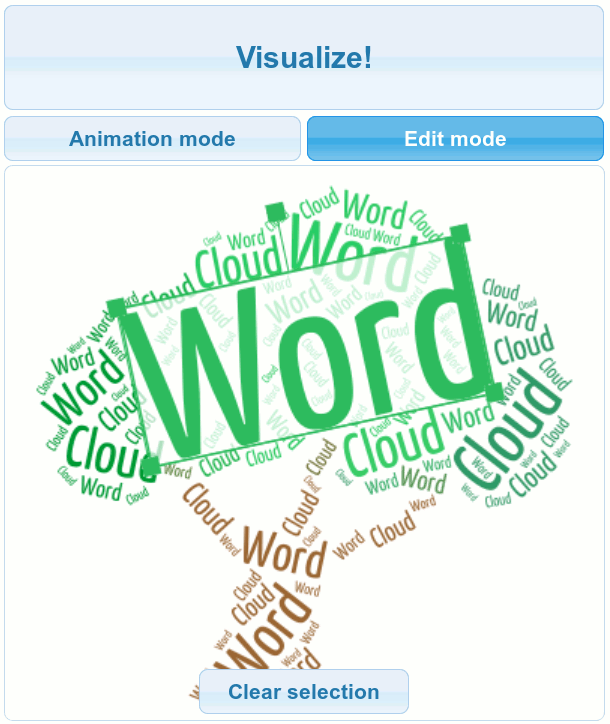 Then select the desired font (.otf and .ttf fonts are supported) and once it is loaded you can now select it and Visualize your cloud!